First, many thanks to BuyTwoWayRadios.com for loaning the KG-UV950P to me. They let me have it with no strings attached - they simply wanted someone to spin the dial on this radio and see what happens. To me, this means they want to be more than just a business that sells radios. Cheers to them! Secondly, thanks to my father-in-law and to a new ham friend, Frank. Both generously helped me with the testing - lending their equipment and knowledge. I was just talking with Frank on a repeater about the 950 and he suggested bringing it over to his shack, so we could put it on his service monitor. I had never met Frank before, but I was happy to take him up on his offer. If you haven't already read the review by Hans, start here and come back. He's got a very thorough post and I won't duplicate his pictures or much of his content. On the subjective side, I can simply say I like the radio. I got on the air more in the last several days than I had in a while. I got good reports on my TX audio. As is common with many of the Chinese radios and, as Hans report, the RX volume seems very loud with course increments. I'm not sure why this is so difficult to correct from a systemic perspective. Unlike Hans, I did not have a problem with distortion as I increased the volume. In general, I think the controls were easy to use and the speaker mic felt good in my hand. Hans found that 6/10 meters can only be accessed from VFO A and I can confirm that as well. I also discovered in playing around that certain menu options (48 FM Radio, 49 AUT AM, and 50 AM-SW) are only available from VFO A. There is a note about those menu options being on VFO A only in the manual, but I only saw it after I figured out the options were missing on VFO B. In general, I would say the manual was okay - far from the worst I've seen. Even without the manual, I managed to figure out several things intuitively - like exiting the FM radio. Someone asked about scanning speeds, which I found acceptable. You can see the channel scanning and frequency scanning videos and judge for yourself. During the testing, we looked at output power, sensitivity, and any problems with spurious transmissions on the harmonics. I can echo the statement by Hans that there were no issues on the harmonics. From a sensitivity perspective, the radio performed very well - no issues to report here either. On to the power measurements now. I know Hans and others were curious to see what I found. As you can see our results are fairly close with a notable exception on 6M at high power. Like Hans, I didn't see much output even on the high power setting for 10M. That might be a showstopper from some - especially those enjoying the conditions on 10 right now. Wouxun has come out of the gate with a solid quad band offering with the KG-UV950R. If we were only comparing it to the way the initial 920 was introduced, this would be a slam dunk for anyone. It appears that Wouxun did a much better job with this radio. I didn't have the distortion problem, but Hans' concerns about the channel spacing (lacks 8.33 KHz spacing) and the power issues we both saw may keep some folks away. But given the low price and overall performance, this may be a great option for a lot of people. In fact, Frank, who helped me with the testing said that he was putting the 950 on his short-list, so he could get a quad band in his car. Thanks again to BuyTwoWayRadios.com, my F-I-L, and Frank! Thanks for your test results; it is good to know that so far all tested samples perform about the same. I dont know what meter you used, or if you had your reading glasses on. 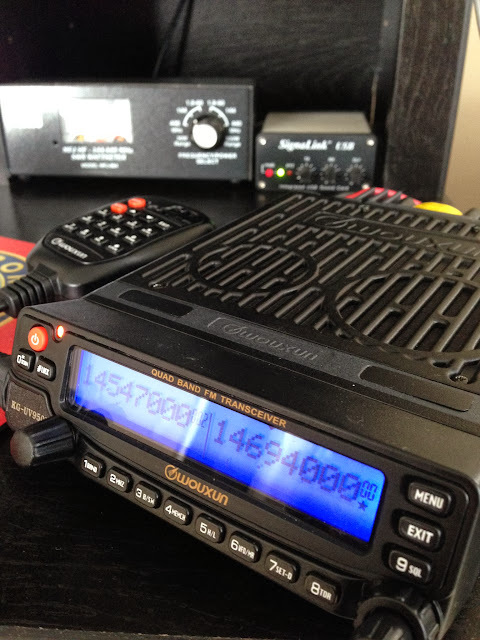 it is 50 watts on 10 meters and 6 meters and vhf 2 meters. uhf is 40 watts. check my video on this radio on youtube search "hamradioconcepts"
Does it receive 2-30 mhz ? Thanks for the testing Brick! Glad to do it. It is interesting for me and I get to learn some. Did they give you a release date? Got an e-mail from Danny at http://www.buytwowayradios.com/ - he thinks he will have his first shipment soon and be able to ship to his customers in early December. Can the RJ45 terminal on the body of the radio be used to connect a TNC? Therefore allowing the radio to be used for voice and data simultaneously? If not, what quad band other than Yaesu's ft9800r is capable of this setup?